First Practice - Monday October 29th! Our first practice will be Monday October 29th. Bus will leave the HS promptly at 6:15pm with our return about 9:15pm! Final Forms - signup and fill out your forms ASAP! Please make sure to select swimming within Final Forms. If you do not have an account please signup on Waynesville’s Final Form site HERE. ALL forms MUST be filled out before practices begin. No forms/no practice or participation! If you have any questions please contact Coach V.
Parent/swimmer meeting for the 2018-2019 season will be held in the HS library on Wednesday October 3rd at 7pm. If you are unable to attend please email Coach V at veronica.cassidy@mac.com. State Championships-Canton, Ohio - WOW! 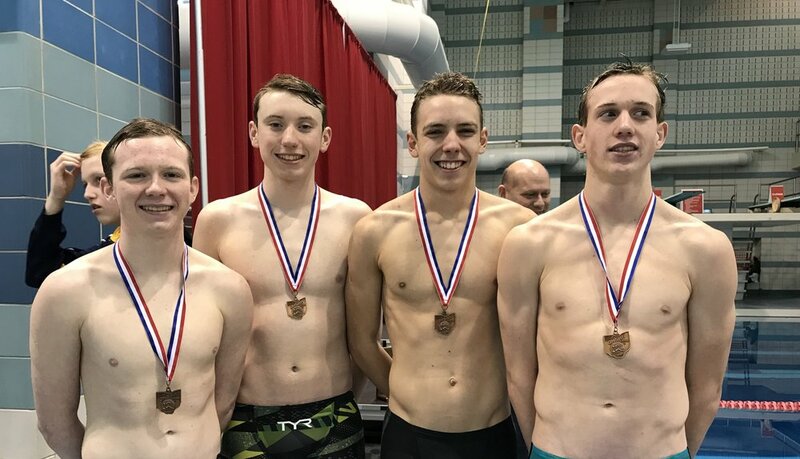 Eight Spartans traveled to Canton, Ohio to compete in the state swimming championships. They came away with the hardware. Led by senior Kierstyn Cassidy who took 7th in the 200 Free and 5th in the 500 Free and anchored the girls 200/400 free relays. Owen Conley collected 2 state titles and one state record in the 200IM and the 500 Free. The Boys then closed out the meet with an amazing swim in the 400 Free Relay placing 16th. Congratulations to all the swimmers.